See below for shade tree descriptions and info. 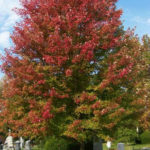 Click “Shop Now” to be taken to our store and full inventory of trees. Leaves are somewhat heart shaped. Spring and summer leaves are glossy green on the upper surface and dull green underneath. 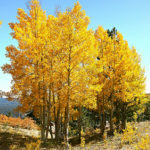 In the fall leaves turn yellow, gold, and in rare instances, even red. Sun to part shade. 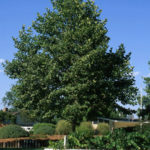 A large distinctive tree with fine-textured foliage. This conifer has sage-green needles that develop a yellowish-brown fall color and then fall from the braches in the winter. Adaptable to wet or dry soils. Full Sun. Handsome pyramidal shade tree with graceful slender branches and exfoliating white bark with salmon undertones. Full Sun. 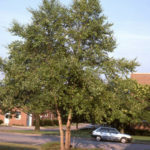 A white-barked birch producing glossy green foliage. Full Sun. 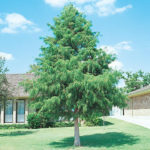 Fine ornamental lawn tree, pyramidal when young, irregular with age. 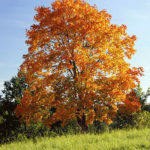 Lustrous dark green foliage turns brilliant orange to scarlet-purple in fall. Full Sun. This ancient species has unusual bright green fan-shaped foliage that turn a uniform, clear yellow in the fall. Very tough tree. Slow growing. Full Sun. 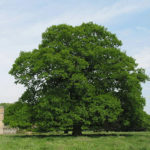 Large picturesque native tree with new leaves emerging with a tinge of pink or purple. Dark green summer foliage. The deep furrowed bark and stout branching add winter interest. Full Sun. 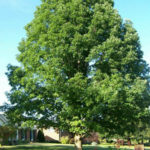 Medium-sized, fast growing shade tree with a uniform pyramidal form. Dense, glossy foliage and very fragrant flowers. Excellent street tree. Full Sun. 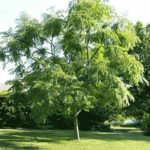 Fine tree for filtered shade with lacy, fern-like foliage. No thorns or seed pods. Full Sun. 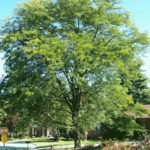 Fast growing, rounded, deciduous tree with deeply lobed leaves. Brilliant reddish-orange fall color. Full Sun. 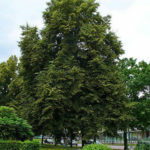 Symmetrical, round-headed tree with deep green leaves. Produces deep shade. Full Sun. 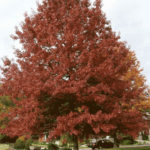 Fast growing, rounded , shade tree with brilliant red fall color. Full Sun. Fast growing, rounded very hardy shade tree. 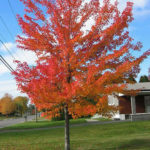 Foliage turns red in fall. Full Sun. 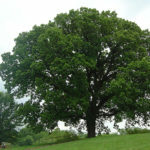 A majestic shade tree for open lawn areas. 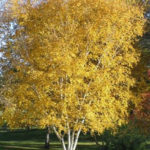 Lustrous, dark green foliage turns yellow to yellow-brown in fall. Slow growing. Full Sun. 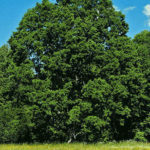 A large, broadly-rounded tree that is excellent for large open areas. The rich blue-green leaves old on late into the season. Full Sun. A stately, moderately fast-growing tree. 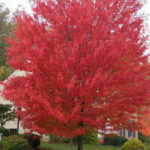 New foliage emerges red, turns shiny green for the summer and becomes a spectacular russet to scarlet-red in the fall. Full Sun. Stately, pyramidal tree with conspicuously horizontal branches. 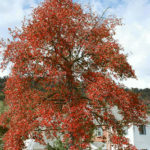 Lustrous green foliage changes to brilliant red in autumn. Rapid growing. Full Sun. Summer foliage is dark green and silvery underneath. Fall color is an impressive wine color and truly breathtaking. Full Sun. 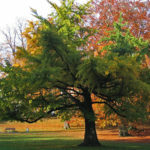 Rapid growing tree for street or park use. Adaptable to soil conditions, hear and drought. Full Sun. 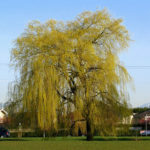 Graceful, slender pendulous golden branches and light green leaves. Will thrive in moist soils. Full Sun. This rapid grower has elegant branching and develops a vase shape at maturity. 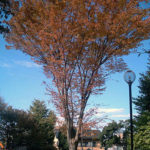 The green summer foliage turns bronze-red in fall. Full Sun.